PEEK (Polyetheretherketone), is a high temperature, high performance engineering polymer for use when the Standard Celcon® Acetal Polymer does not meet the performance requirements of the application. 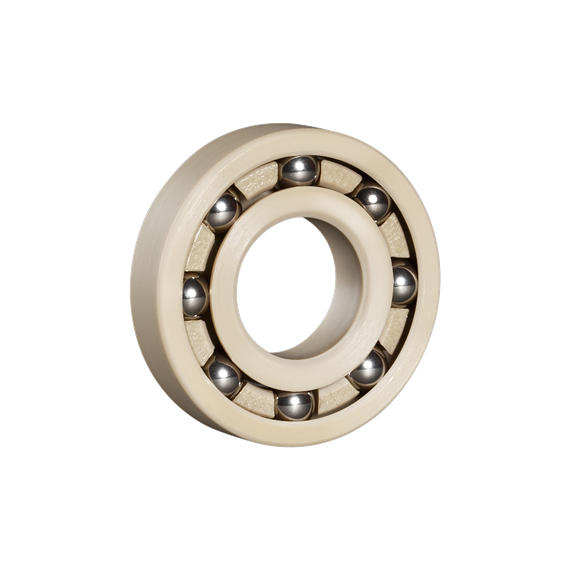 These standard bearings are fitted with either SS316 or glass balls. PEEK offers chemical and water resistance similar to PPS (Polyphenylene Sulfide), but can operate at higher temperatures. PEEK can be used continuously to 480°F (250°C) and in hot water or steam without permanent loss in physical properties. For additional information see Materials. For high temperature radial ball bearing applications, trust KMS Bearings.